Oh how I LOVE the sun! I am as solar powered as my home and now I have an All American Sun Oven to do all my summer cooking. 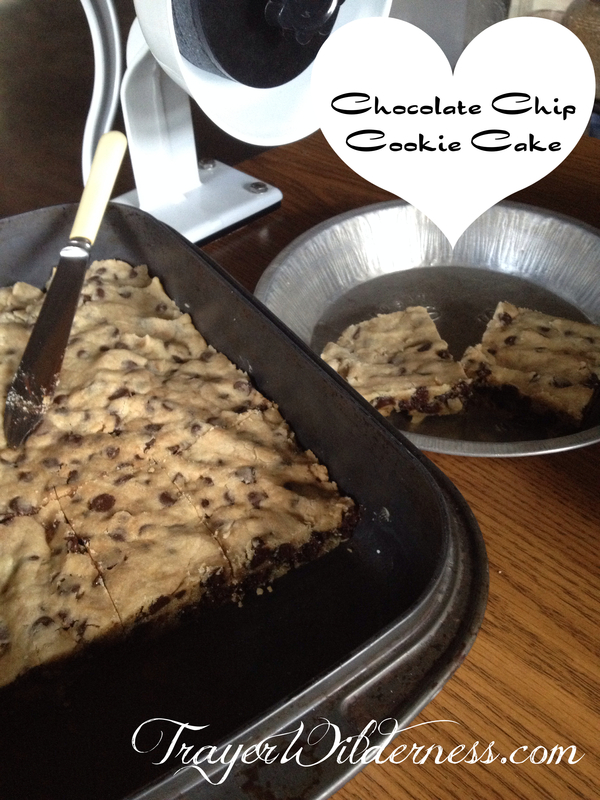 Today, I did the unboxing of my All American Sun Oven and decided to make my Chocolate Chip Cookie Cake for my men. Below you will find the video on how to use the Sun Oven and my new solar kitchen. You will also find the recipe below. My hope is that you will find this informative and realize the resources you have at your fingertips which could provide a meal at the end of the day and no money out of your pocket to do so. 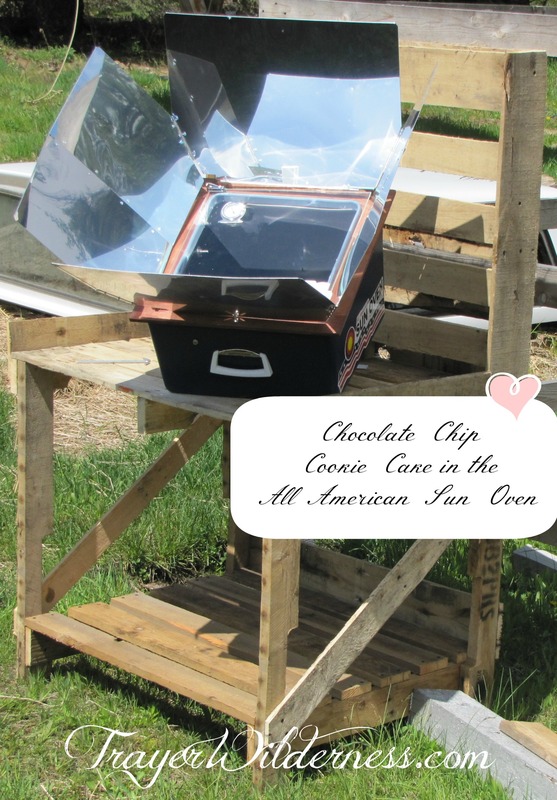 I was very impressed by the construction, quality and ease of use for the All American Sun Oven. It is light weight, easy to setup and even easier to use. I am excited about the endless opportunities I have to cook and bake in this oven, the time saved on busy days and the beauty of a meal being ready at the end of a long hard busy day here in the wilderness. NOTE: If you would like to have this recipe in a handy format, be sure to subscribe to our newsletter and receive this recipe on page 57 and many more for FREE in my 72 page e-book titled The Trayer Wilderness Cookbook ~ Homesteading The Traditional Way ~ Volume 1. You can also purchase it for a friend here or suggest they join our newsletter too! Combine flour, baking soda and salt in a small bowl or measuring cup. Beat butter, sugars and vanilla until creamy in a mixing bowl and then add eggs. Beat well. Gradually beat in the flour and then stir in the chocolate chips. You can choose to drop the cookies on a cookie sheet with a spoon or you can place this whole batter into a 9 x 13 pan and bake for roughly 30 minutes. If you are making individual cookies the cooking time is roughly 8 to 10 minutes. You can also use the All American Sun Oven and bake for roughly 2 hours. For those of you that are on a low sugar or sugar free diet as I am, I found a Sugar Free Brown Sugar recipe that I would like to share with you. A special thank you to Gwen’s Nest for sharing the recipe which can be found here. Eating healthy is a BIG concern of ours and everything we make here on the homestead is homemade which includes a lot of our main ingredients that are either freshly ground or as in this case the Sugar Free Brown Sugar is homemade to provide us with the healthiest ingredient. Stay tuned for many more solar meals, desserts, breads, pizzas, sourdough breads and baked goods and casseroles, oh and all our fresh garden vegetables. What would you like to try cooking or baking in the sun? This is beyond awesome! I love this recipe and this concept of using the sun to cook our food. I’m slowly changing our families’ eating habits to gluten free to try to avoid some health issues (and acne later on for our girls!) so I always appreciate a good gluten free recipe, especially one that is so amazingly frugal as well! The sun oven is a little less expensive than a brand new oven, but of course it saves so much money in the long run because you’re not using electricity. I live in Oregon, on the coast. I wonder if it would still work well for me? Hello Lovely Lady… So glad you popped over to check it out…. I am so excited about being able to be working in my garden or on an outside project all day and knowing that I do not have to prepare a meal at the end of a long day. It is really sweet being able to cook using the sun. I am really thrilled with the Sun Oven. If you have sun – you can use it… Things will still cook on cloudy days, but it takes longer. As long as you have 4 hours of direct sun you should be fine. I imagine with you being on the coast you will be in really good shape. We live in the wilderness in Idaho.. 🙂 Also in regard to your diet – we are 100% gluten and dairy free and my website has TONS of gluten free recipes and if you have any questions regarding anything gluten free – feel free to give me a shout – we have been gluten free for over 10 years and I am always happy to help others with the knowledge I have gained over that time…. Really glad to have you joining me and if you have any recipe requests for the Sun Oven – let me know!! Blessings to you and yours and look very forward to getting to know you! If you haven’t, be sure to join our weekly newsletter then you won’t miss any of the upcoming recipes and parts to the series.